Images converted from the Zillions files by Steve Evans. Chu Shogi. Shogi variant on 12 by 12 board. Hello, in my current Chu Shogi game with Greg Strong I am not able to move a piece whatever I do with my mouse. 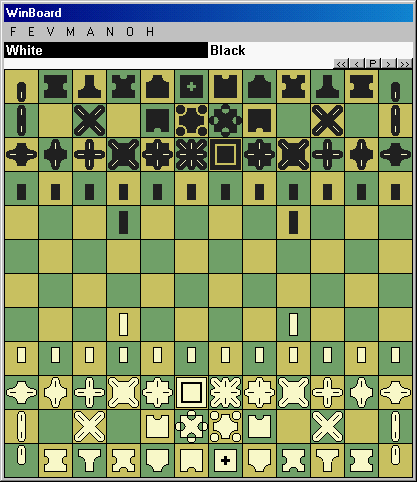 I have made a version of the WinBoard Alien Edition that uses this piece set, and implements variants chu, dai, dada, maka, tai and tenjiku using them. I am also writing an engine to act as AI for these games, but the current version (HaChu 0.0) only does Chu and Dai, and quite weakly at that. A zip file that bundles WinBoard Alien and HaChu 0.0 can be downloaded from http://hgm.nubati.net/WinBoard-Chu.zip . Thanks, Abdul-Rahman. I've just been working on these pieces in the past week. This is something I'll be releasing tomorrow. It will, I hope, be the first of many projects involving large shogi variants to be put in alfaerie form.